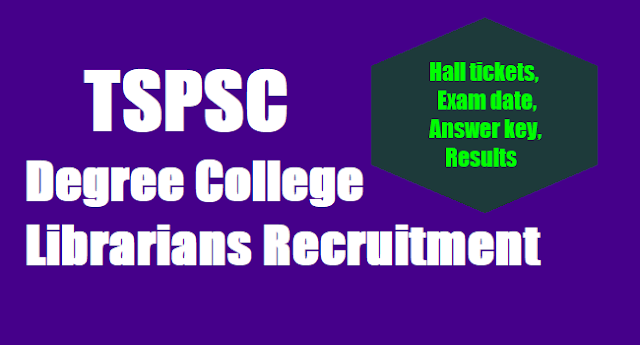 The results of the Main Examination held on 12/05/2018 AN and Oral Test (Interview) held on 04/10/2018 at TSPSC Office, Hyderabad, 17 candidates with the following Hall Ticket Numbers have been selected against 21 vacancies for appointment to the post of Librarian in Degree Colleges vide Commission’s Notification No.24/2017, Dt:02/06/2017, the selections have been verified and published here-with subject to the following conditions. If it comes to the notice of the Commission at a later date that any candidate furnished false information or the selection is not in order due to any act of omission or commission of any candidate , then his/her provisional selection is liable to be cancelled at any stage and he/she will forfeit all consequential benefits including that of selection, besides that the Commission reserves the right to take any action as it deems fit in the circumstances of the case, in terms of the various provisions as notified in the Notification No. 24/2017. On the basis of Main Examination and subsequent certificate verification for the posts of Physical Director and Librarian in TSWRDC(W) vide Notification Nos. 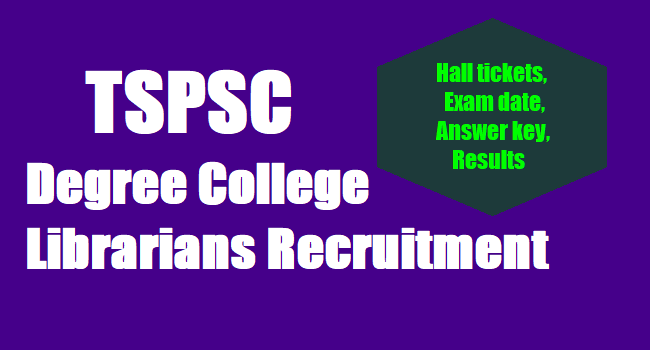 23/2017 and 24/2017 respectively, the candidates with the following Hall Ticket Numbers are provisionally shortlisted for Interview at TSPSC Office from 10:00 AM onwards. The candidates who are provisionally admitted for Interview are required to attend along with all Original Certificates, Hall-Ticket, (3) Pass port size photos and Verification Certificate which is issued by the Commission at the time of verification failing which, they will NOT be admitted in subsequent process of selection. The Interview is scheduled on 04/10/2018 in the Commission’s Office, Prathibha Bhavan, Opp. Gagan Vihar, M.J. Road, Nampally, Hyderabad. A copy of this result can also be seen on the Commission’s Notice Board. The candidates are hereby instructed to give their online zonal preferences i.e., Web options on 25/09/2018 and 26/09/2018 failing which their candidature may not be considered for selection. i) Good Academic Record with Master’s degree in Library Science with minimum of 55% marks or an equivalent grade of B in the 7 point scale with letter grade O,A,B,C,D,E & F or equivalent degree obtained from the Universities recognized in India. ii) Should have passed National Eligibility Test (NET) for Lecturers conducted by UGC / CSIR, or similar tests accredited by the UGC or SLET conducted by PSC / Universities of the State. iii) If a candidate possesses Ph.D., or equivalent is exempted from passing National Eligibility Test (NET) for Lecturers conducted by UGC /CSIR, or similar tests accredited by the UGC or SLET conducted by PSC / Universities of the State. 2) A relaxation of 5% marks may be provided (from 55% to 50%) to the Ph.D. Degree holder who passed Master Degree prior to 19-9-1991. The Main Examination (Objective Type) is likely to be held on ............ The Commission reserves the right to conduct the Examination either COMPUTER BASED RECRUITMENT TEST (CBRT) or OFFLINE OMR based Examination of objective type.